We've been so well trained to not even realize what we are doing: paying other people for food, and throwing away the ways to get more of that food. For the last few years, out of sheer laziness, I have serendipitously found several plants that can be propagated or resurrected back to usefulness out of food scraps. In theory, you've already paid once for this, no need to pay money again for seeds or plants of things you already have! If you have any to add, please do in the comments section. Knowledge is power! I bought a basil plant from the grocery store. 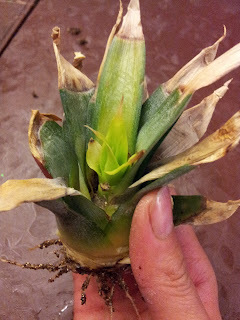 It had three plants in a small pot, and I cut those thee plants in half to use the leaves in a recipe. 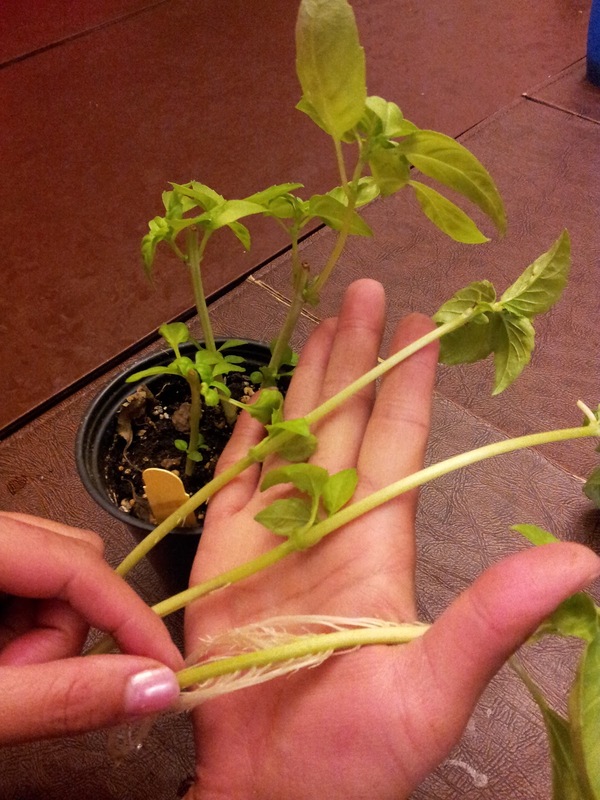 After picking off the basil leaves, I placed the three stems into a glass bottle with only tap water. Sort of like what you do for cut flowers, except I put it up on a window ledge that gets lots of sun. Wait a few weeks, and voila, the roots came out of nowhere! With only the magic of water! I think the warming up of the water by the sun had something to do with it, too! But as you can see, now I have 6 plants instead of only 3 to plant outside my garden. 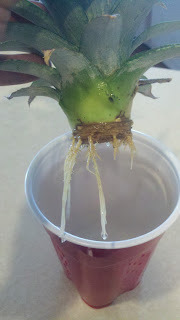 Various stages of root development. I am not sure why, but throughout my whole life, I don't recall eating celery hearts. Once we ate all the crunchy outer stalks I'm sure by the time we got to the nub of the middle with the bendy blanched sad center, we pitched it. Well, this too is a grand mistake for the veggie gardener! You can place that sorry looking middle nub with baby stalks into a glass of water and place it on a sunny windowsill. Within a week or so, you will not only see that middle stem beef up, but it will grow roots. At this point, you can plant it into the ground, and grow celery for the season. YEAH BABY! This, I wasn't the best at. 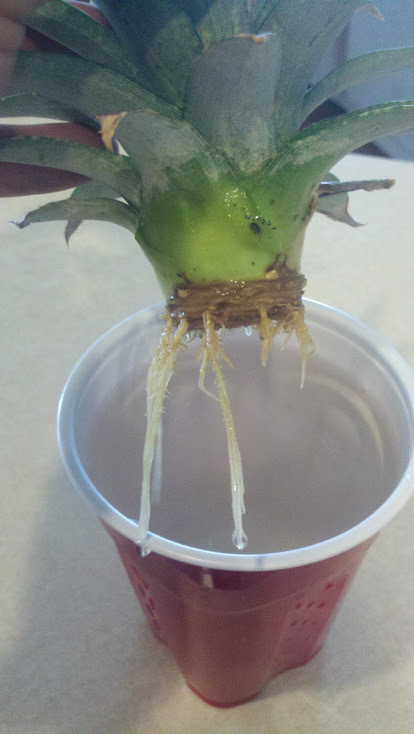 For some reason it took me seven pineapple tops before I got one of them to root, but I have a friend who does this with insane success! After eating a pineapple, remove any meat from the top, and place in a cup of water. I tried this a few times and failed, so mine (above) looks sad, but is coming back to life. This one, I had sitting in a pot of vermiculite. I have another one that is doing very well, which I just threw into a pot of an existing plant and left it for dead. Plants. They silly! 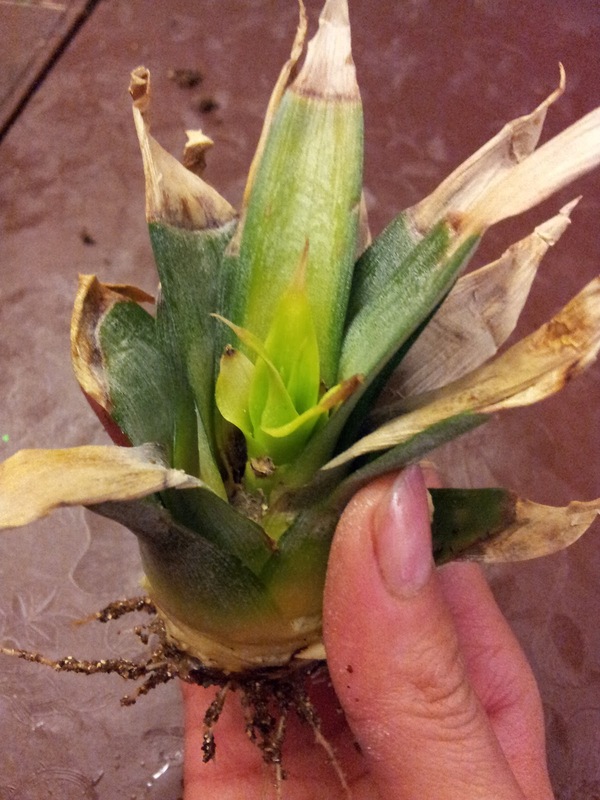 Here is my friend's pineapple top which he put into a plastic cup for amazing success. As you can see, no meat left on the pineapple top, or it WILL turn rotten! Now, this... This is a surprise for even me. We had slices of some sort of brassica's stem. 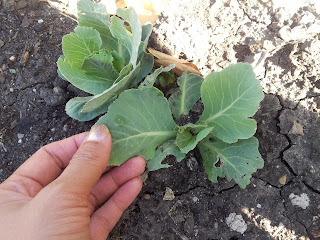 I was most likely being lazy and instead of putting it into the compost bin, I put it into the garden during the winter. Well, if that don't beat all... it grows back. And it wasn't just that one freak accident, there is a second slice of stem growing in my garden, too. What these brassicas are, I have yet to figure, because it was a crosswise cut of the stem. My kids and I have been successful in replanting lemon, orange, and tangerine seeds in vermiculite. Avocado-sitting on a jar of water with toothpicks through it, and Mango seeds which have been dried for a few days, and then planted into a pot of dirt. However, these adventures must be taken with an acceptance of wildcard, because the fruits you get from the grocery store are mostly genetically criss-crossed. Therefore, what we are growing from seeds makes really nice houseplants, but nothing more. In fact many of them have not flowered in the 5+ years we have owned these plants. The avocado flowered once, but without a pollinator it just had it's glory moment and fizzled away. HOWEVER, that being said, they are glorious houseplants we receive compliments on, and give a nice tropical flair to this Chicago home. Especially on the deck in the summer! Scary looking little critters, aren't they?? Sprouted potatoes can be planted whole, or you can just snap off the sprouted eyes. Either will grow. Sprouted garlic cloves can be placed into the ground, and in about a year you will have a whole head of garlic! If you repeat this cycle, you'll never have to buy tomato plants/seeds ever again. Actually, if you try the experiments listed above, you'll never have to buy additional seeds and plants for the listed items you've already eaten! Reducing, reusing and recycling? Re-purposing? At the very least, you're guaranteed to save money and come to a realization of how much we take for granted and throw away on a daily basis. this is great! andrew also tried green onion - planting the white bulb and that grew pretty fast - and the stub of a head of romaine which he stuck in a small cup of water. new leaves started growing out of the top after only a few days.